The tinkling of the anklets announced the arrival of the young ladies, Lord Sambara had kept in Lady Mayavati’s honor. Peals of young laughter resonated in the otherwise silent room. But the laughter stopped as their eyes fell on the solitary figure of the lady staring out of the window, overlooking the ocean. Her face reflected the turbulence of the ocean, her anger evident in the stiff stance of the body. The young girls quietened down, well aware of the reason behind Lady Mayavati’s temper. “My Lady, the bath is prepared and time is running out. Your Lord might visit you any moment.” Sulochona, the most experience in the lot spoke to her softly. “But you’ve no other option.” Sulochona really hoped this beautiful, stubborn girl would consent to her Lord or one never knew how the wrath of the Lord would fall on them. “Is my bride ready?” Boomed the voice of the mighty Asura, Sambara from the hallway. The young girls scurried away, thankful that their master would have his interest occupied somewhere else and not bother them. Though they pitied the beautiful Lady, they could not help her. “My Lady, my Love.” Sambara’s boisterous voice complimented his appearance. Mayavati shuddered as her eyes took in the protruding red eyes, immersed in madira, his bulging stomach dancing a merry dance of its own, in spite the tightened silken sash hugging him possessively. His stoutness enhanced by the golden ornaments generously endowed on him. Locks of his curly hair fell on his leering face as he came towards her. “Stay away from me.” She commanded despite the fear in her heart. “Come on. Don’t be tedious.” He enjoyed the hunt but today her beauty had intoxicated him. In fact, he had not slept a wink from the moment he had seen her wandering in the jungle, gathering flowers. But something about her had stopped him from approaching her. Her defiant beauty, her graceful body and her voluptuous breasts had set fire coursing through his body but a sixth sense had warned him to approach her carefully. Was it the radiance of her beauty or the way she carried herself? Surely she was not a celestial being, was she? But his misgivings were unfounded as his soldiers reported that she was an orphan staying in the nearby Rishi’s hermitage. One evening while she was returning he approached her, sure that she would be gratified by his attention. “You’re the most beautiful maiden I’ve ever met.” His voice rang with sincerity and he sincerely hoped that she would have him as her Lord. “Thank you. But I’ve been promised to someone else.” She said in a demure voice. Could things go any more puzzling? “Are you playing a game with me?” He demanded. But was quickly mollified at her scared expression. But she surely did not make sense. “No.” The small chin jutted out, enhancing her stubborn thoughts. “Now, you’re insulting me.” He thundered. Both Mayavati and Sambara jerked towards the intrusion. Sage Narada stood near the bushes watching them amusedly. This puzzled Sambara. Since when did Narada support the Asuras. Still he had to be respected. “I’m like the wind. Sometimes here and sometimes there.” Could Narada get any more irritating? But kept his thoughts to himself. “Greeting O great sage.” Mayavati’s sweet voice sent the flow of love rushing in the Asura’s heart. “Destined for someone else? Yes I heard you speaking to Sambara.” Nararda smiled and for a moment Sambara was stunned. Why did he get a feeling that Narada was helping him? There was a saying in the Asura world. 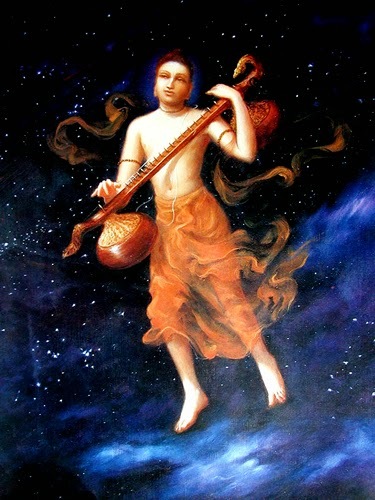 Being a friend of Narada is equivalent to being an enemy of Narada. He wondered what Narada had up his sleeves. There someone realized his worth at last thought Sambara preening like a peacock, which rapidly turned into rage as he saw the look of disgust passing over the lovely maiden’s face. “Even the Sage realizes my worthiness. You are ready to live in poverty with the hermits but not as my Queen?” Could she not see how beautiful her life would turn out to be? Well if she could not see, he would just have to show her. “How?” Sambara was by now totally bewildered by Narada’s attitude. That’s it! How can this chit of a girl, albeit a beautiful one, decide whether he is capable or not. Everyone will laugh at his manhood. 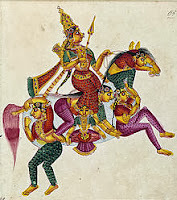 Without even waiting to thank Narada, he called his soldiers and his horse and quick as a lightening whisked Mayavati in front of him, shouting and screaming. And now she stood before him defiant and proud, ready to fight him to retain her virginity. This would be a losing battle for this beauty. Sambara could taste his victory as his mind envisages his ravishment of hers. Suddenly her eyes widened as her eyes rested on the wall behind him. “What? What is the problem?” Surely at the time like this she would not faint? That would surely ruin his plan. “Sage Narada is here.” She could not keep the anger out of her voice. “What? Where?” He whirled around to once again face the great Sage. Though he was totally irritated at Narada’s impromptu appearance, but seeing the panting state of Narada, he understood that it had to be urgent. “What?” Who was more shocked was difficult to gauge- Sambara or Mayavati? Sambara’s face whitened. And to think he was just about to kiss her. He needed time to think and to decide whether Narada was up to his usual trick. He stumbled out of the room, not waiting for Narada to leave. Sage Narada came towards Mayavati, his face had a jovial smile as if making a Asura angry was his daily affair. Mayavati did not know how to react. “My destination?”Mayvati was getting more puzzled by the conversation. “Yes. Sambara cannot even touch you. He will be reduced to ashes.” He declared. Mayavati felt an anger rising within her. She could not be sure where the anger was stemming from. But she could feel a whirlwind rising within her. Her eyes caught her reflection in the mirror. No more the demure girl faced her. Her face flushed with anger, her eyes whirlpools of years of anger and pain, her chest heaving with some past memories,too painful to remember. Right now she felt all her anger was centered to Narada and she woundn’t mind burning him to ashes. Burning him to ashes? Why did this thought send a tearing pain down to the very core of her being? Why did it invoke images of someone burning? The images felt so real, so potent that she could almost smell burning flesh and hear cries of agony. Beads of perspiration marked her forehead as she staggered to the big bed adorning the center of the room. Narada kept on watching her from the corner of the room, making no attempt to help her or soothe her pain away. Mayawati curled herself into a fetal position willing the pain to go away. Time lapsed, all sounds receeded as Mayavati relived her past. Flashes of memories became a reality. Unheard voices became a clarity and deep buried secrets found their way to her memory. Slowly she got up and turned to Narada still standing in the corner with his head bowed. “Thank you Narada.” She said quietly. “Under your guidance, Lord Kama will remember all his mayavi shakti’s. After all you and he are one.” Narada felt humbled by the love Rati had for Kama. He knew Lord Kama would be safe here after he arrives in Samabara’s kitchen in the form of an infant. After Narada left, Mayavati aka Rati stood in front of the mirror. Her eyes blazed in anger but her heart felt a hope rising at the upcoming events. 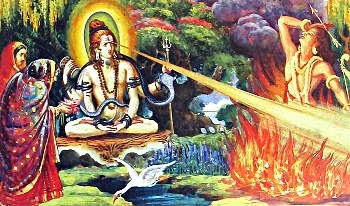 Lord Shiva had kept his promise. Now she had to just wait for Pradyuman to arrive. But how could she stop Samabara from destroying the plan? If he could not have her, then he might throw her out of his Palace and that would ruin all her plans. Well she was known as the greatest Mayavi,wasn't she? Standing in front of the mirror she concentrated and soon the image from the mirror separated from her. Mayavati thanked her and quickly went out of the room towards the kitchen while Mayavi with her illusionary smile waited for the Lord Sambara to visit her again. The above story is written by Rubina Ramesh in response to the challenge posted by Siddhesh Kabe at Indifiction. Siddhesh has put up the following challenge to the members. "This is a challenge I have taken up and would post it for anyone interested. India is full of mythological stories and stories that never made out of the region. For e.g., I visited Talakadu that has an epic story of Mysore King who was cursed that the kingdom would be sunk under sand. First point will be to research the stories as it is, second to strip it of its mythology and rewrite the story as you would have written. Look beyond the miracles and magic and write the story as a story teller would tell it. Take any favorite story from any mythology that you have heard since childhood. Wikipedia it for details and rewrite it." I always found the story of Goddess Rati very facinating. The Goddess of Beauty and Sensuality had a life full of pain and seperation from her lover. She was always waiting for him to return to his form after being cursed by Lord Shiva. She stayed true to him and waited for him to be born as Pradyuman, son of Lord Krishna and Rukmini. But the story does not end there. While doing my research I came across many hidden untold facets which I would further like to discover and write about. Thank you Siddhesh for putting up this challenge and Luciferhouseinc for having this wonderful group. Rubina, can you please give me the link of the original story as I am not familiar with it? This story is of Rati while she was waiting for Kama to be reborn as Pradyuman. My main source has been the Wikepedia,Bhagwat Purana and Vishnu Purana and a source of story wealth. My Dadu. [Grandpa] I am hoping to turn this into a full fledged novel. It is really a very interesting story. This was a very good narrative. Made a rather interesting read. Not sure if Siddhesh had as is mythology in mind or he somehow wanted Gods and magic off the horizon. But just as a story, it read well. That was an interesting writing Rubina, awesome effort. Your story telling style is very nice. A comment on the story, instead of Narada explaining her the destiny or anything you could use that to your advantage and make it a thrilling read. Add a pang of mystery to the narrative. When you rewrite a story you get the opportunity of intensifying it a bit, don't lose that opportunity or it again goes in the line of preaching. Thanks Siddhesh!! Will incorporate that in the story. Thanks for the suggestion. Wow Rubina! This is excellent. I just came across this one when I was searching for a blog link that you had sent me. Am I glad! It's too good. And I so like this idea. Feel tempted to try one. Hey Rubina...you jogged my memory by reposting this story and I'm wondering whatever happened to the full novel that you were supposed to write based on it! I am looking forward to reading it! Hey I am so glad you brought this gem to light. From the moment I began reading Usha Narayanan's Pradyumna, I have been thinking of this story of yours Rubina. I learned to write mythology fiction after reading this story of yours. Truly inspiring. Can't wait to see your full fledged novels. If I remember right, there was a contest around this and a feature in DNA. Am I right? Beautiful story, Rubina. Why have you left it lying for so long? You must pick it back up. I quite like how it is told from Mayavati's pov. C'mon now. Don't think too much and complete it. Good luck.